Is this winter over yet? I hope not. We just bought a new snow blower. 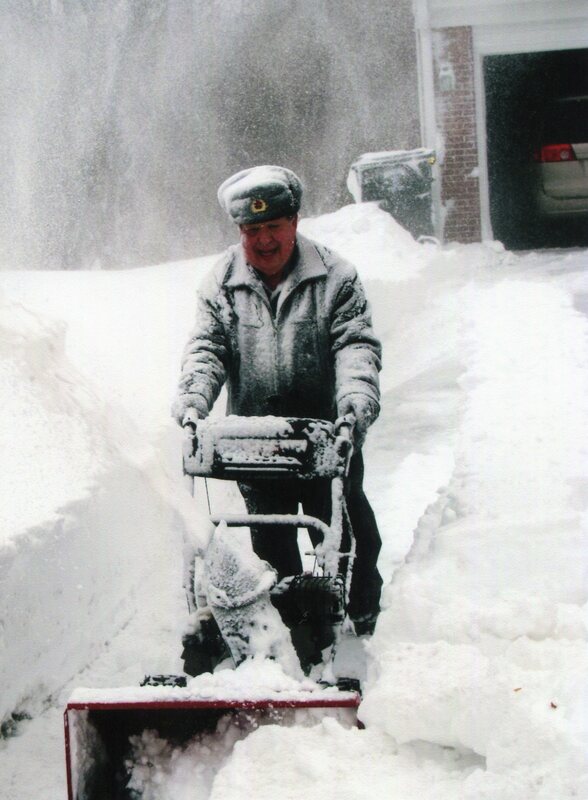 Born to shovel by hand. I admit to being a shovel-Luddite. Maybe even a snoglodyte. Since our first sidewalk and driveway, I have happily moved a near-biblical glacier of ice, snow, salt and sludge with an aluminum spade or a plastic pusher in my cold, gloved hands. Meanwhile, in the last two decades, snow blowers have roared along our street like stock cars. Every garage has given up a place for the machines to park, and drip a puddle of oil and slush, from December to March. 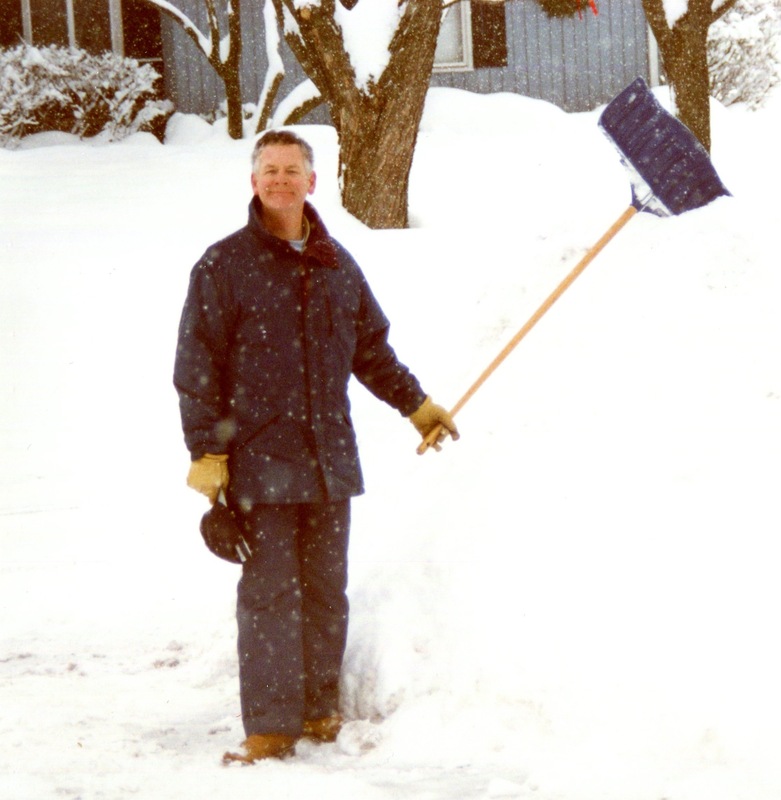 And while my neighbors festooned the street with animated, white plumes of snow, I continued to pump away at the shovel like John Henry, determined to beat the machine. The neighbors take to the streets. 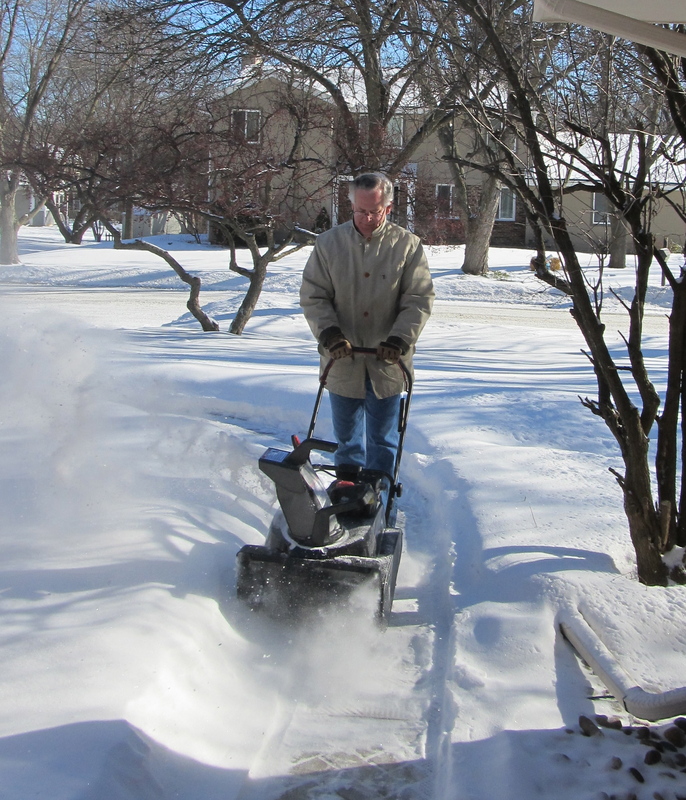 My late adopter attitude has been a source of discomfort for my snow blowing friends. With every winter blast, they individually had to debate helping me, or not. And if they did run their 16-hp chain-driven, double-augured tank up my sidewalk, were they committed to follow up with each new dusting? 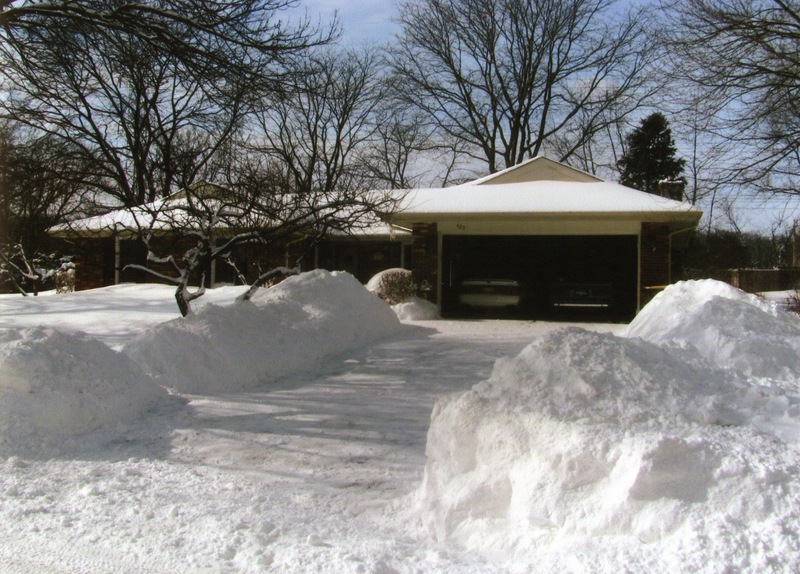 Then last June, our kind neighbor Angela gave me her snowblower. Not out of charity mind you, no. But because the family was moving to southern California where they were more likely to need a dump truck equipped with a fire hose and back hoe. I fell for their ’97 Toro CCR 2000 like a ton of salt. This cute little red machine had snorted and gobbled up snow under Angela’s operation for years. This was a gateway moment. The Toro had a new, loving home. And I had a new toy. The little Toro kept up the pace. As you are now much aware, we have had a spectacular winter so far, and my adopted Toro has trimmed, cleaned, and swept sidewalks far beyond our borders– great fun! What’s more, the neighbors are now settled down. They are at ease because I have joined the 21st century with internal combustion. They no longer worry about me embarrassing them with a heart attack. They start their engines, and I start mine. Until last night. Threatened with another polar vortex, I brought out the Toro for a quick clean-up. This is a gratuitous testimonial for the little engine– it eats snow like a Zamboni on Jet-A fuel. So with another blow-out on the way, I primed the machine and pulled on the starter cord. Like all good plans, they change. 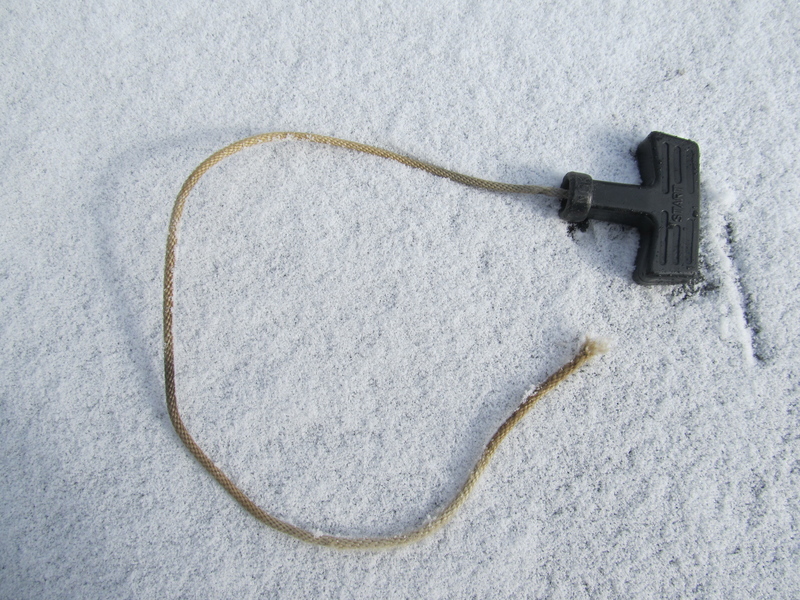 The cord ripped right off its mount with a loud sproing. I held in my hand, 12 inches of frayed nylon string. The machine lay still, like death. Meanwhile, snow was blowing across the street a la Zhivago. Without a minute to spare, I hustled the Toro into the back of our car and rushed over to Ray’s Small Engine Repair and Lawnmowers. Ray runs a tidy, bright shop. Out front he has a display of snow blowers– bright red machines, shiny, ready and eager. In the back, he runs a repair shop. In a separate room he has a collection of old, used machines. They looked like a gang of bar-fighters, waking up in jail after a long bumptious night. Not a good sign. And here I am, standing in the driveway, staring at the sky, hoping for snow. The east coast is buried under another 100-year blizzard. In Chicago, the forecast is maybe 1-2 inches. Hardly enough to crank up the new Murray. I’ll get out my shovel. Thanks for reading! If you have ever been in the same position waiting to take on Mother Nature, now you know how I feel, or how Lieutenant Dan felt sitting on the mast of Forest Gump’s shrimp boat. Please share the story, and feel free to “follow” Riper Conditions ! Thank you Martin. I hope we get a mess of wallops. They are especially good with maple syrup and sausages. Anyway, back out to the snow watch. Conditions are RIPE! �� DYN-O-MITE, your best yet!! So good to get some laughs about this winter … and I’m off to Quebec City in twelve days to watch one of my great nephews in a hockey tournament. Great to hear from you! What a winter. We are going to Kauai in a couple weeks. Enjoy the hockey!